Modafinil is a compound whose intended purpose is to induce wakefulness. It has been commonly used by individuals such as military personnel and medical residents in order to maintain wakefulness in order to "get the job done" under stressful conditions. Modafinil is a synthetic molecule, and it is commonly prescribed to induce wakefulness. A common use case is for the purpose of staying awake during night shifts (e.g., for medical residents in hospitals, or security guards or military personnel working night shifts). The trade name for modafinil is Provigil. 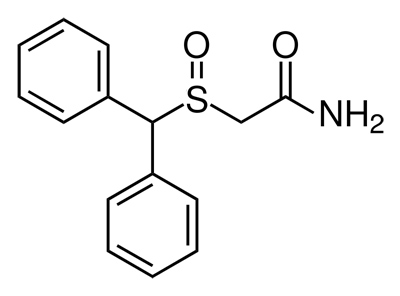 The chemical name for modafinil is 2-[(diphenylmethyl)sulfinyl]acetamide. The base structure is an acetamide, with a diphenylmethyl-sulfinyl group attached to the secondary carbon of the acetamide. Modafinil is a synthetic compound that has been used clinically to induce wakefulness. In terms of pharmacological effects, there are several main ones. Modafinil acts on the dopamine transporter, which normally controls the amount of dopamine that is taken up at the presynaptic axon terminal of a neuron. Upon binding the transporter, modafinil prevents the dopamine from being taken up, therefore leading to increased amounts of dopamine staying in the synapse. This is important because a higher level of dopamine in the synapse leads to increased chance of stimulatory activity. Dopamine generally carries many effects including increased motivation and increase attention span. Furthermore, dopamine can lead to improved speed, accuracy, and long-term memory consolidation.1Note that this specific effect of modafinil takes place mostly in the hypothalamus. It is important to note that there are adverse effects for modafinil in some individuals. These effects are usually due to significantly increased activity of dopamine. Known adverse effects that occur in over 10% of individuals include diarrhea, nervousness, and anxiety. Studies comparing modafinil and caffeine have actually demonstrated that higher dosages of modafinil may not be as effective as caffeine, but higher dosages yield similar effects as caffeine. One important study has highlighted5In particular, it was found that dosages of 400 mg modafinil led to reaction times that were similar to those yielded by 600 mg caffeine (n=49, P-value <0.001). It has been shown that high dosages of modafinil (400 mg) can lead individuals to exhibit similar reaction times as they would experience if taking 600 mg caffeine. While it has not been directly studied, it would be interesting to see a head-to-head comparison between modafinil and caffeine the blend of caffeine and theanine. This would be a great scientific question because studies have shown that the combination of caffeine and theanine has been more effected than using caffeine alone. For example, it has been shown that the caffeine-theanine combination has resulted in a 20% improvement in the item recall in reaction times using the simple reaction time test.7More information about these effects can be found in the Caffeine-Theanine page. Yes, the benefits of modafinil on attention and wakefulness have been substantiated in a long history of studies. That still doesn't mean we recommend it. Unfortunately, modafinil is not an FDA classified Generally Regarded as Safe (GRAS) compound. Furthermore, there are a myriad of side effects, the most alarming of which are withdrawal symptoms including headache and elevated fatigue (i.e., "crash"). Future research should dive into how to make compounds that carry beneficial effects of modafinil but with limited withrawal symptoms. Wesensten, N. J. (2006). Effects of modafinil on cognitive performance and alertness during sleep deprivation. Current pharmaceutical design, 12(20), 2457-2471. Baranski, J. V., Gil, V., McLellan, T. M., Moroz, D., Buguet, A., & Radomski, M. (2002). Effects of modafinil on cognitive performance during 40 hr of sleep deprivation in a warm environment. Military Psychology, 14(1), 23. Caldwell Jr, J. A., Caldwell, J. L., Smyth III, N. K., & Hall, K. K. (2000). A double-blind, placebo-controlled investigation of the efficacy of modafinil for sustaining the alertness and performance of aviators: a helicopter simulator study. Psychopharmacology, 150(3), 272-282. Wesensten, N., Belenky, G., Kautz, M. A., Thorne, D. R., Reichardt, R. M., & Balkin, T. J. (2002). Maintaining alertness and performance during sleep deprivation: modafinil versus caffeine. Psychopharmacology, 159(3), 238-247. Randall, D. C., Shneerson, J. M., & File, S. E. (2005). Cognitive effects of modafinil in student volunteers may depend on IQ. Pharmacology Biochemistry and Behavior, 82(1), 133-139.